Ghent (Belgium, Temperate maritime climate, Koppen Cfb) is a city of about 200.000 inhabitants, and the 2nd biggest city in the Flanders region. The medieval centre is surrounded by a dense belt of urban neighbourhoods built in the 19th century. Apart from water regulation issues, the city suffers from noise and serious air pollution from traffic and industrial activities and lack of accessible green space. The cities’ inhabitants and government are taking major efforts to increase available green space, decrease traffic and pollution, reduce climate impacts and increase biodiversity. Major efforts have been undertaken to increase the ecological network in and around the urban zone, for ecological as well as socio-economic reasons. The city of Ghent is a living laboratory of well-documented experiments with urban ecosystems at various scales and from government led to entirely autonomous in governance. The aim is to develop a realistic framework of indicators to evaluate, manage and develop performant Urban Green-Blue Infrastructure (U-GBI) in cities and intensively managed landscapes. UrbanGaia explicitly focusses on analysis of ecological and socio-economic features of the many existing GBIs. 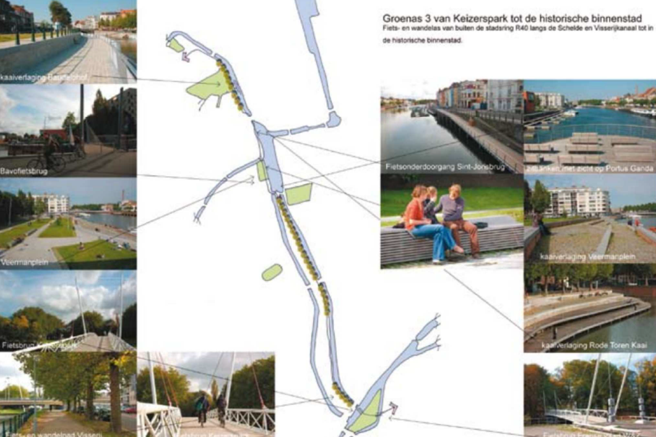 The evaluation of one the green axis of the ecological network in Ghent will serve as a case study for the framework of indicators. Furthermore, policy, governance and management practices of U-GBI are analyzed to identify innovative approaches to GBI implementation and usage. UrbanGaia combines three approaches in its actions: ecological studies, socio-economic studies and stakeholder involvement. Stakeholder involvement is an essential aspect throughout the ecological and socio-economic studies. Through a stakeholder analysis the relevant stakeholders are identified and approached to participate in the study. Maps are developed that shows the land-use, GBI, biodiversity, connectivity and ecological quality of the urban system, and are validated by the key stakeholders. Furthermore, we want to assess the stakeholders demands and develop tailored lists of relevant indicators for the assessment of performant U-GBIs. Besides, a policy analysis (and the uptake of U-GBI) and an assessment of the governance impact (implementation of U-GBI) will be conducted. Key Performance Indicators (KPI) are used to synthetize the diverge range of data, indicators and information, and will be used as a framework to evaluate, manage and communicate the performance of U-GBIs and compare U-GBI across diverse case studies and typologies.